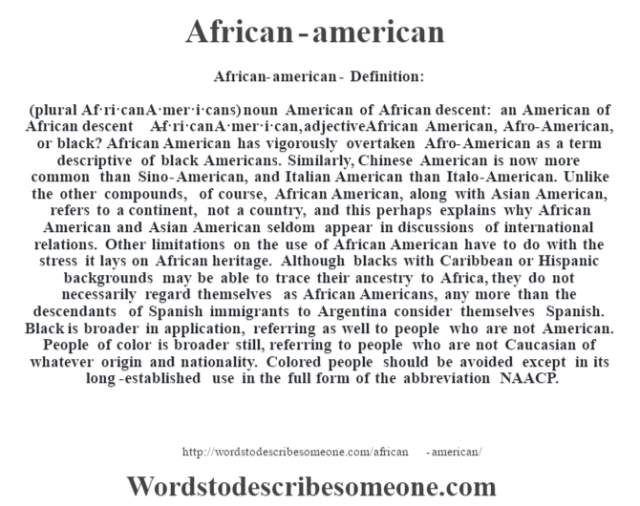 (plural Af·ri·can A·mer·i·cans) noun American of African descent: an American of African descent -Af·ri·can A·mer·i·can, adjectiveAfrican American, Afro-American, or black? 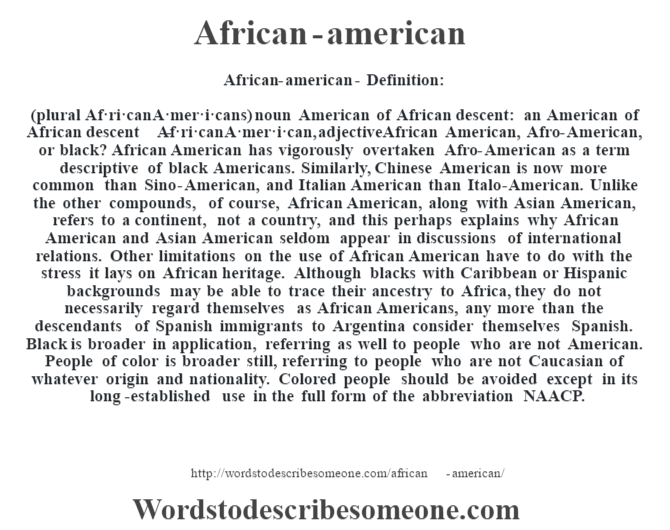 African American has vigorously overtaken Afro-American as a term descriptive of black Americans. Similarly, Chinese American is now more common than Sino-American, and Italian American than Italo-American. Unlike the other compounds, of course, African American, along with Asian American, refers to a continent, not a country, and this perhaps explains why African American and Asian American seldom appear in discussions of international relations. Other limitations on the use of African American have to do with the stress it lays on African heritage. Although blacks with Caribbean or Hispanic backgrounds may be able to trace their ancestry to Africa, they do not necessarily regard themselves as African Americans, any more than the descendants of Spanish immigrants to Argentina consider themselves Spanish. Black is broader in application, referring as well to people who are not American. People of color is broader still, referring to people who are not Caucasian of whatever origin and nationality. Colored people should be avoided except in its long-established use in the full form of the abbreviation NAACP.